Those who think arts and culture in British Columbia is a recent development might be surprised to learn that opera has been flourishing in the province for well over a hundred years. The first full performance in Victoria took place in 1877 and in Vancouver in 1891. This first-ever history of opera in BC celebrates important milestones for BC's two major companies: Vancouver Opera's 50th anniversary, with the 30th anniversary of Pacific Opera Victoria following in 2010. It also marks the recent upsurge in the popularity of the venerable art form, with new opera groups and simul-cast venues proliferating across the province. Illustrated with over 100 exquisite photographs and rare archival images, Bravo! 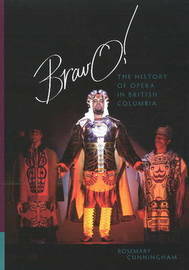 traces the history of opera in the province from its colourful origins in touring companies, to the determined efforts of BC's opera pioneers who laid the foundations for two of Canada's most renowned opera companies, culminating with in-depth reporting on recent developments at Vancouver Opera and Pacific Opera Victoria. Special features include behind-the-scenes accounts of contemporary productions, full listings of Vancouver Opera, Pacific Opera Victoria and Modern Baroque Opera productions and detailed information on BC opera singers, composers and opera training in the province. Rosemary Cunningham has held season's tickets to Vancouver Opera for many years and is a loyal fan of Pacific Opera Victoria. Following retirement from her career as a librarian, she began a second career as a writer. Bravo! is her first published book. She lives in Vancouver.